Monty might look relaxed, but he's always ready to pounce. Monty perched here for a long time, looking at a bird or a squirrel. 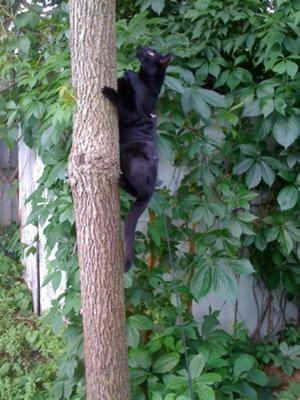 Monty, my little ex-feral cat and I have been having a lot of fun outside, now that the weather has cooled off. He wanted to go out in summer, but he would mostly sprawl out in the dirt trying to cool off, and then I would bring him in. He's been allowed out off leash now and then, especially since my husband has blocked up all the gaps in the fence. It's also not the season for baby birds learning to fly, making themselves easy targets for playful cats, and the bees haven't been too bad lately. Even so, he's only allowed outside with me there with him. Most cat owners would probably not take the time to sit outside with their cat for anywhere from twenty minutes to over two hours a day. At first I found it annoying and boring and I'd bring my i-phone or journal out-- but lately I've found that sitting out there with Monty is very relaxing and quite a good relief from stress. It's certainly better than sitting in front of the television, and I get fresh air and exercise too. Just another way cats make our lives better. My back yard is actually quite a mess. I'm just not a gardener, and aside from cutting the grass we do nothing back there. It was very overgrown and weedy when we purchased the house. We got rid of the worst of the weeds, but otherwise it's kind of wild back there. No one can see it from the road, so we don't really care. There is a tiny wooded strip in the very back next to the fence, which until recently I never really noticed. 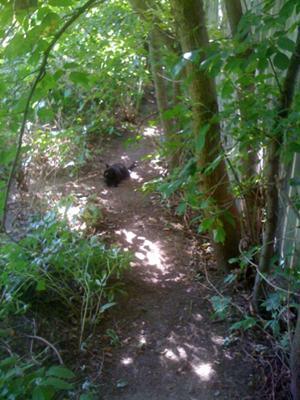 One day while out with Monty I started thinking about making a little path through the tiny wooded area, like my sister and I used to do in the ravine by our parents' house when we were kids. We would clear all the weeds and brush and actually sweep the path with a stick so there weren't even leaves on it. We probably had a good couple of miles worth of paths crisscrossing through those dense woods when we were kids. So I cut a little path by the back fence and it felt like I was 12 years old again. Now Monty and I play back there all the time. He loves to chase small stones that I throw down the path. 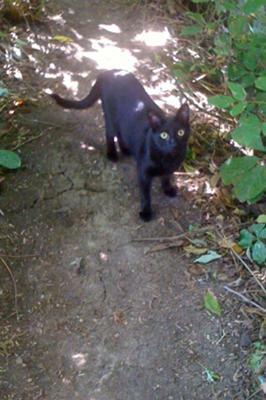 He walks up and down the path or jumps into the brush and weeds next to it. I sit under the trees and remember how being out in the ravine made my childhood such a wonderful time. Our cats would play outside with us, just like Monty does now. It would be weird, I suppose, for a grown woman to sit under the trees in her back yard for an hour, but with Monty I have an excuse. It is our little paradise back there, a safe quiet place where the outside world doesn't matter because we're having a good time together. Monty did have one adventure a couple of weeks ago with the neighbor's dog. Oscar (he's a little wiener dog) stuck his nose through a gap in the bottom of the fence and Monty nearly took it off with a swipe of his paw. Luckily, I had him on the leash that day, and later I had my husband put a big concrete block in front of the hole to avoid any other mishaps. Oscar will never again stick his head through there, but Monty kept trying to get away from me and go through that gap for days afterward-- he had to finish the job of clawing Oscar's nose I guess. I like to think he was protecting me, but who knows-- I actually like Oscar, but I don't dare tell Monty. I'm still amazed how my life has changed for the better since catching Monty as a kitten that summer's day. I recently read that feral cats have about a 1-2 year life expectancy on their own. His little life would be just about over (if not already snuffed out) if I had not brought him home to live with me. The residents at the skilled nursing facility where I work ask about him all the time, and I find myself rushing home from wherever I am to get back to Monty and enjoy some outside time with him. He's not a real cuddly cat, but he likes to be wherever I am. I think his favorite inside activity is watching me sort and file papers. If I try to sleep late he keeps coming up on the bed putting his cold nose on me and staring at me. When I open my eyes it's like he's saying, "C'mon Mom, do something interesting. Or better yet, take me outside!" Eloquently stated Ruth. To accuse the whole of America for the stupid moves of politicians and blind laws is short sighted. Leah, I had not thought of the connection there between the reluctance to outlaw those awful videos of animal cruelty, but outlawing the one thing that helps feral cats. However, Milwaukee county does now allow TNR. And the laws which were on the books were not bad laws, just not applicable to TNR. It is wrong to abandon a pet. And it is problematic to feed wild animals. Our city parks are almost unusable due to the amount of Canadian Geese-- which are there because people feed them. The problem is that neither law was applicable in any real sense to feral cats, but at least the legislature has figured that out. The problem in America is that shortly after we elect someone to public office he or she almost always becomes either corrupt or stupid. This doesn't mean that the average American is against TNR or for those horrible videos. Even some of our most corrupt politicians get it right sometimes. When there was a proposal to allow shooting of feral cats in northern Wisconsin, Governor Doyle said basically, "Over my dead body. Nobody is going to be shooting any cats!" I will be writing the next governor asking him to continue Doyle's stance on this issue. Also, Milwaukee is so backwards that you really can't judge the country based on us. We haven't even managed to separate our rainwater and sewer systems, so we've been dumping Billions of gallons of sewage into Lake Michigan every year. But last summer when a contractor allowed some concrete fragments to fall into the Milwaukee River it was all over the news and he was fined heavily. The rest of the country and even the rest of Wisconsin is smarter than this. Milwaukee has always been poorly run, but the average people here are wonderful-- friendly and caring. And they are starting to rise up and take their government back. I think the new TNR programs are a validation of that. Kudos to the brave workers at the Humane Society who challenged the anti-TNR laws! As much as living in a suburb of the most screwed up city on the planet bugs me sometimes, I wouldn't change a thing, because then I wouldn't have found Monty. In any country there will be people who just don't care about the plight of animals, but if you look you will always find those who, if they are able to catch a feral kitten will take him in and give him a good home. Why its illegal to TNR? One minute I hear that somewhere in America they won't outlaw videos showing shocking videos of deliberate animal torture because it violates freedom of speech then I hear that that won't let ordinary people feed or neuter feral cats! This is helping those poor little souls (who lets face it! the only reason they are out there in the first place is because someone dumped an uneutered cat who then went on to breed! They are everyones respomsibility!) so isn't this a violation of freedom of human speech as well? Ruth I know you're American but the more I hear about American politics and the lack of respect for animals the more I wonder what America is all about. I visited your country once, before I knew all about this but I certainly wouldn't be in a rush to come back. Miss Sheridan, I know exactly how you feel. Monty was part of a litter probably born under my porch. 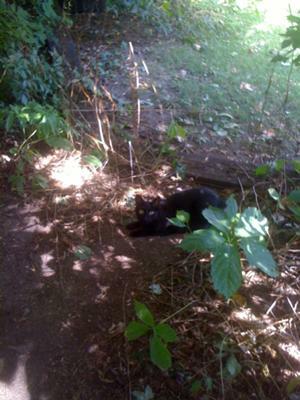 Animal Control trapped some of the kittens and I caught Monty, but two were left to fend for themselves as feral cats. I haven't seen them around in awhile. Until recently trap-neuter-return was illegal around here, so my husband didn't want us to get involved in it-- even though the Humane Society was running an underground TNR program. We could have been heavily fined, both for "abandoning a pet" when releasing the neutered cats and for "feeding a wild animal" when feeding and caring for the ferals. Both arguments make no sense, so I'm glad that they are finally trying TNR here. It is something you could look into in your area. As much as you want to help them, if you aid unaltered cats you could be enabling them to breed when otherwise they might not have been able to, causing even more heartache. I personally wouldn't feed stray or feral cats unless they were part of a TNR program, though I know some people do it. That being said, I suspect (pretty much know) that the striped cat from Monty's litter, and some other cats also, spent the winter in my basement-- well, kind of next to the basement. We have an old cyclone door on the side of the house that's in rough shape, but the bottom, inner door to the basement is very heavy and we have it blocked off, so we haven't fixed the outer storm door. The cats got in through a gap under the cyclone door and managed to survive the winter living down there next to that inner door. Monty was always sniffing over there in the basement all winter and once when I was outside I spoke to the striped cat and she turned and looked at me with such interest-- she had heard my voice before through the basement door. I told Jeff not to fix the hole under the storm door, because where will the cats go in the winter? It gets really, really cold here. I don't want to perpetuate over breeding, but I can't bear the thought of little kitties freezing to death either. I liked your story. I care for some feral cats. I moved into a property 2 years ago and I noticed several cats in my bins. I watched them and there was around 6 of them. I've started to feed them and every day at 7.30pm they all come to my door. They are not afraid of my dog and my own cat is friendly with them. They now trust us that much we can actually stroke them. I feel sorry for them though as its getting cold now. I'm going to empty my outside coal shed put a couple of boxes and blankets in there and see if they will go in to shelter. I do worry about them endlessly. Thank you for coming to the site and staying to share. I like your story very much. It has a poetic, lyrical quality. It has quality. You can come back anytime and share some more. You are more than welcome. And, to me, it makes perfect sense to sit outside amongst nature keeping Monty company. He looks like my Charlie.